Doxycycline is an antibiotic that is used to treat a variety of bacterial infections. Can I buy Doxycycline online? The Online Clinic can prescribe Doxycycline for a number of bacterial infections. 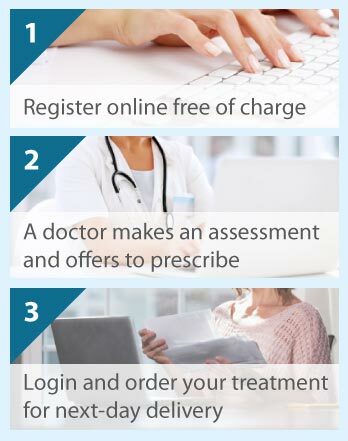 Our doctors will perform an online assessment as to your suitability, with an answer in around 30 minutes. If you are offered a prescription and you choose to proceed, the medication will delivered straight to your door from our pharmacy within 24 hours. There is no consultation fee. Doxycycline is available on prescription for more than one type of consultation. Doxycycline is used to treat various bacterial infections including: chest infections; sinusitis; STIs (such as Chlamydia, Mycoplasma and Ureaplasma). Doxycycline has been used to treat Gonorrhoea in the past, but most strains are now resistant to Doxycycline so alternative antibiotics are used. Doxycycline is sometimes sold with the brand name Vibramycin, but can also be sold generically as Doxycycline. Doxycycline can be taken as a malarial prevention medication. It is normally taken if you are travelling to areas where there is a high risk of falciparum malaria being resistant to chloroquine. If your doctor prescribes Doxycycline for malaria prevention, you would normally take it two days before your trip to the area considered to be high risk, for the duration of your trip and for 4 weeks after leaving. If we decide to prescribe Doxycycline for you, the doctor will provide full dosing instructions on the medication label. Doxycycline is part of a class of antibiotics known as tetracyclines. Doxycycline works by blocking the production of certain proteins. Without those proteins, the bacteria are unable to grow, replicate or multiply. Without the proteins they either die or can be killed off easily by the immune system. Most people will take Doxycycline and notice no side effects. However, where there are side effects, the most common are diarrhoea, nausea and vomiting. It can also intensify the effects of UV light, so people taking this medication should avoid the sun or use a high factor sunscreen. Like other antibiotics, Doxycycline can also interfere with the contraceptive pill, so additional protection may be advised while taking this medication. When should you not take Doxycycline? It is recommended that Doxycycline (along with certain other antibiotics) should not be taken with aluminium, magnesium or calcium-based antacids. This is because they would cause the medicine to bind to the intestines and prevent it being absorbed. It is also not suitable for people with liver or kidney problems, porphyria or women who are pregnant or breastfeeding. The price of Doxycycline starts at £29.95. This price includes the private prescription and delivery of the medication before 1.00 pm the following business day. There are no hidden fees.